Knowledge is not to be acquired from without. It is the innate nature of the human soul and the essential birthright of every man. To appreciate this quote, we must, first of all understand what is meant by knowledge here. Knowledge here does not mean data and information about the world around us. This is objective knowledge acquired by the study of the world around us. By knowledge is meant subjective knowledge. Knowledge that helps us answer the deeper questions of life – Who am I, what is the nature of reality, why do we exist and where did we come from, etc. 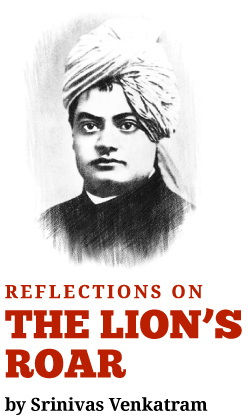 Swami Vivekananda says that these deeper questions cannot be answered by searching in the world outside ourselves. Answers to these questions cannot be found in nature, and for that matter, even by trying to ‘follow’ or ‘learn’ from other human beings. These answers are found only by ourselves and they are to be found within ourselves. Why can’t we get answers to these questions from other human beings, who might have found answers to these questions? Because we would not believe those answers, even if they were true, if we did not encounter or ‘see’ the answers for ourselves in the depth of our soul. This is the primary difference between objective and subjective knowledge. Objective knowledge can be acquired through (i) experiencing the world outside us, (ii) through our senses or instruments that amplify our senses, or (iii) through reasoning based on data that we accept to be true for various reasons. Subjective knowledge is not acquired but discovered by diving deeper into oneself and “uncovering” what is within us. Swami Vivekananda makes a further point. This subjective knowledge resides in the soul of every person and therefore is accessible to any human being who chooses to turn inwards and dive into the depths of ones soul. This means that every human being has the right and the innate capacity to answer the big questions of his or her life related to identity, purpose, meaning, fulfillment, etc. to his/ her own satisfaction. This also means that every human being is a light unto oneself and does not need to accept secondhand the truth about one’s own life.